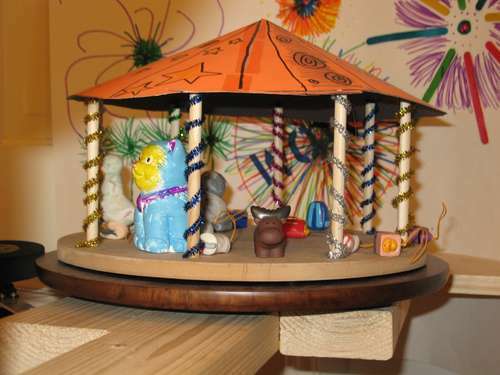 The TeleToyland Carousel system consists of two main components: The camera, and the control system. The control system starts on the web server, where we use simple form buttons for the Left, Stop, and Right commands. PHP scripts convert those clicks into commands to a NetMedia SitePlayer Telnet which connects to the Internet and has an RS232 port for the servo control board. The servo is run from a Lynxmotion SSC-32 servo motor control board, and for this project, almost any simple SSC would be fine like the Pololu Maestro line. This Instructable covers the construction. This is a toy carousel controlled by a hobby servo. Why would we build such a thing? Well, we have this site where you can control fun robots and devices via the Internet, and I have a daughter who wanted to get involved. 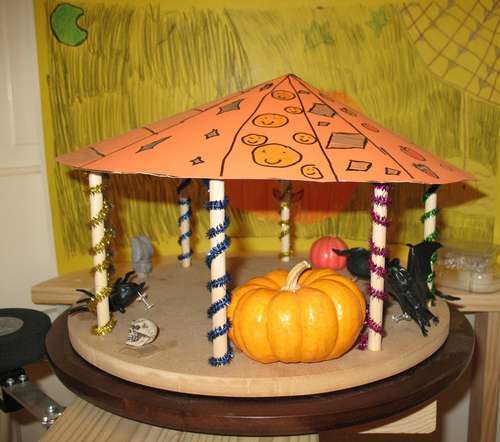 So, the carousel is her project - you can make it go left or right, and she gets to decorate however she wants - usually seasonal. You can check her current toy selection online at the TeleToyland Carousel. In addition to it being a live web project that you can play with, it has two other interesting maker features: It uses a regular hobby servo to drive a much bigger load, and we used small magnets to attach the carousel to the base so it can be removed and replaced easily - it just magnetically snaps on and off.